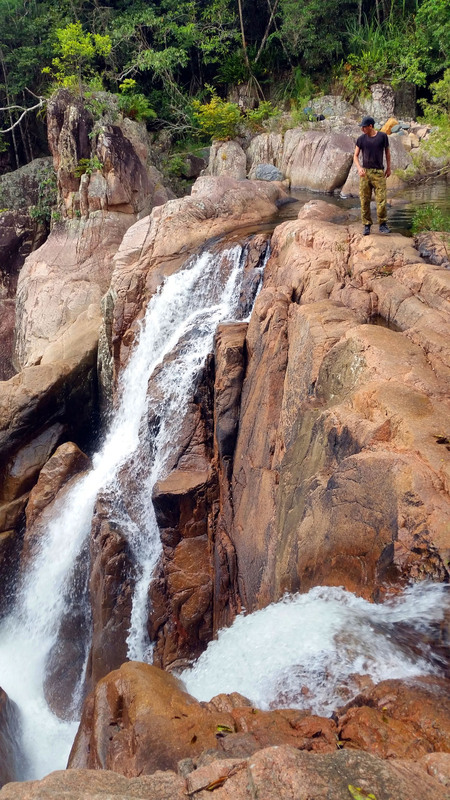 Chances are if you live in Townsville, then you have been to Jourama Falls at least once or twice. But have you ever been to the top? On a crisp Autumn morning we set off to do just that - and beyond. 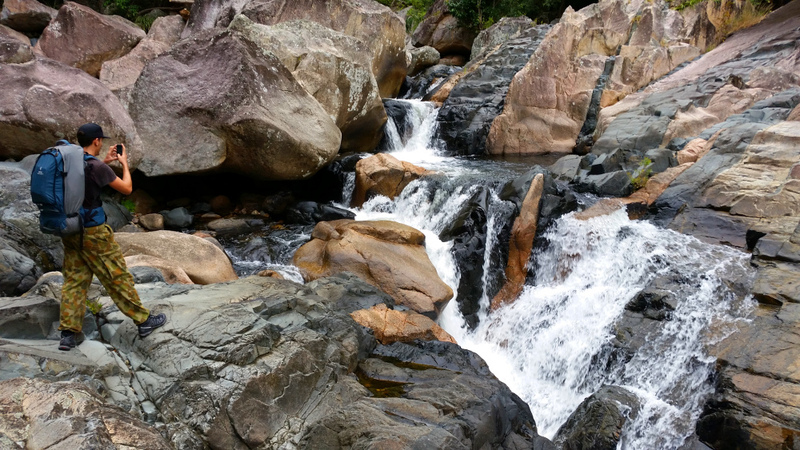 The hike to the top of Jourama Falls is actually quite simple for a fit bushwalker. As long as you are not afraid of getting your hands dirty, or the ever-present threat of a fatal snake bite, you should have no problems. Pack lightly with a little food and 2 litres of water and you'll be up there in around 2 hours or less (please note that we packed for a possible overnight stay, so you should travel much lighter than what is pictured). The distance you'll cover is actually very short, but the steep incline will have you moving at a slow pace. If you are used to hiking non-beaten tracks then you'll find nothing new here, but the uninitiated might struggle with the lose dirt inclines, thick overgrown grasses, and mass of flora that has armoured itself with spikes and blades. You'll want a decent pair of mid-high boots with an aggressive tread, as well as rugged clothing to cover as much of your skin as possible. A long sleeve shirt will stop your arms from getting cut up, but I considered it optional. Even on a cloudy day, sunglasses will stop your eyes from being skewered - but this is all really just bushwalking 101. Once you reach the end of the maintained "look out" track you'll have to find your own way to the top. There is rarely any visible track made by previous climbers but we have provided an interactive map plotting our chosen route to the top, and a couple of extra notes. Walk back from the lookout about 20 metres. You can leave the track from anywhere along here. You want to head straight up the incline, in a slightly rightwards facing direction from the falls. You want to ascend for about 300 metres. This is the steepest ascent that you'll encounter, so don't be discouraged if you need to stop and rest a few times along the way. At this point, try to find this natural lookout (pictured below). It's a great place to rest, and take advantage of any breeze - not to mention the view! If you are unsure of what line to take now, swing wide out to avoid dense forest and an impassable valley wall. You will find it useful to study satellite images before you go, or store them on your smart phone for access during the hike. If you don't have that option, the best way I can describe it is to travel parallel with the river, staying about 250 metres out until you get about 100 metres past the top of the falls. As seen on our map (above), choose a line down into the valley that avoids the affectionately named "stinging" forest that is in line with the top of the falls. There a few small swimming holes available at the top to refresh yourself, just ignore the small leeches - they won't drink much. The main hike is more or less over. Take a few pictures, a quick dip and have some lunch. 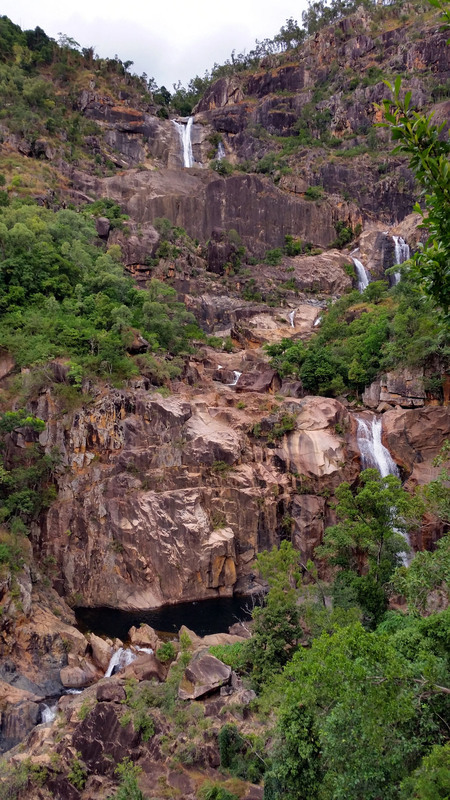 As you might have seen in one of our videos, you can jump safely down the very top waterfall, into the pool below. Jumping down is the easy part. Climbing back up is not. I do not advise doing so unless you are a very adept rock free climber, have ropes available to aid you, or like us, are somewhat mentally unstable. As we had done this climb a few times before, we decided to push it a bit further. We have carried enough food and water for 2 days, and camping gear incase we had to stay the night. Following the river upstream, we found it pretty easy going for the first few hundred metres, however after that it became increasingly difficult. 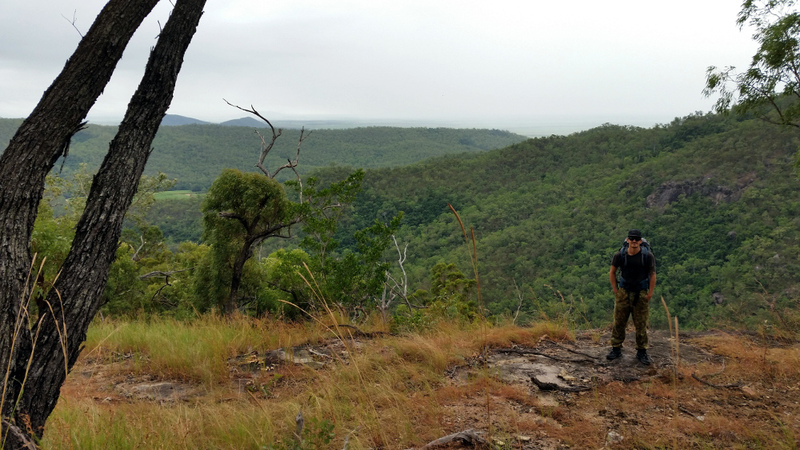 Multiple waterfalls forced us to climb high and through thick, untouched forest. It didn't help that the rains decided to move in, and the otherwise simple rock hopping became a slow crawl. Our aim was to reach a seemingly large waterhole, just over 2km upstream from the main falls (see map), and camp there overnight. 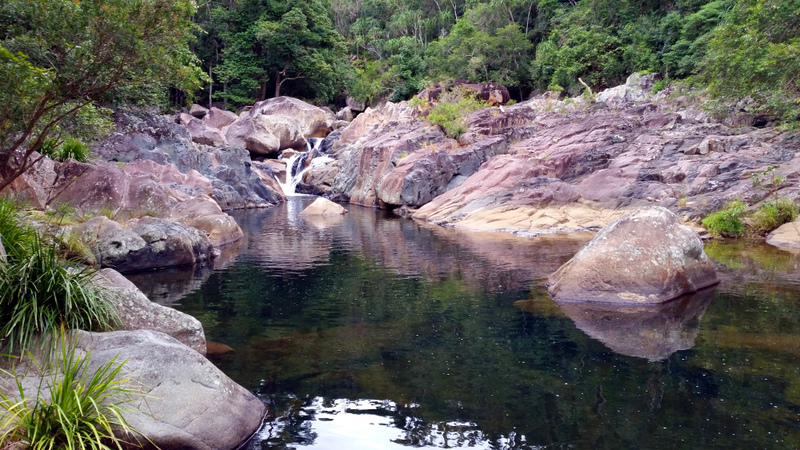 I'll admit that the scenery was beautiful, as NQ national parks often are, but the trek was rough on our bodies and although we made it only a few hundred metres from our destination, after seeing the last waterfall we had to surpass, I made the call to pack it in and make haste back to the car. It was a slippery wet sprint back. The one advantage of the rain is that we no longer avoided creek crossings, wading enthusiastically through waist deep water. There was no time to stop and rest if we were to make it back to the car before dark. Photographs by Luen Warneke, written by Matthew Robinson. See also the other Jourama Falls articles. More posts by Matthew Robinson.